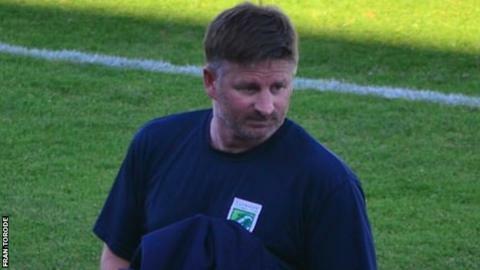 Guernsey FC manager Tony Vance says he is angry and frustrated at his side's 2-1 loss at Peacehaven and Telscombe in the Isthmian League Division One South. Ross Allen gave them a first-half lead, having just missed a penalty. But the home side hit back with second-half goals from Jamie Brotherton and Bouwe Bosma to secure the win. "It's frustrating, but more I'm disappointed, to be honest - and angry. We threw that game away," Vance told BBC Radio Guernsey. The defeat was the second game in as many weeks that Guernsey have led 1-0 before losing 2-1 after last week's loss to Folkestone Invicta. "The first half was decent, but we weren't ruthless enough," Vance added. "We controlled periods of the game, passed the ball around fairly well, but the second half was terrible. "We allowed them to get back into the game and I'm really disappointed."